Harvard librarian Hester Thursby knows that even in the digital age, people still need help finding things. Using her research skills, Hester runs a side business tracking down the lost. Usually, she's hired to find long-ago prom dates or to reunite adopted children and birth parents. Her new case is finding the handsome and charismatic Sam Blaine. Sam has no desire to be found. As a teenager, he fled his small New Hampshire town with his friend, Gabe, after a haunting incident. For a dozen years, Sam and Gabe have traveled the country, reinventing themselves as they move from one mark to another. Sam has learned how trusting wealthy people can be—especially the lonely ones—as he expertly manipulates his way into their lives and homes. In Wendy Richards, the beautiful, fabulously rich daughter of one of Boston's most influential families, he's found the perfect way to infiltrate the milieu in which he knows he belongs—a world of Brooks Brothers suits, Nantucket summers, and effortless glamour. As Hester's investigation closes in on their brutal truth, the bond between Sam and Gabe is tested and Hester unknowingly jeopardizes her own safety. While Gabe has pinned all his desperate hopes of a normal life on Hester, Sam wants her out of the way for good. And Gabe has always done what Sam asks . 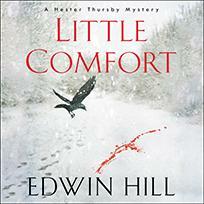 . .
Edwin Hill has written for the LA Review of Books, The Life Sentence, Publishers Weekly, and Ellery Queen Mystery Magazine. He is the vice president and editorial director for Bedford/St. Martin's, a division of Macmillan.